What Is I Ching Hexagram 27 All About? I is the Chinese name of the I Ching Hexagram 27. Do they have has inner and outer trigrams forming mountain over thunder. People also call this Hexagram ‘nourishment’ or ‘the corners of the mouth’ or ‘comfort and security’. Hexagram 27 divination teaches to choose your words wisely. The soul and spirit need nourishment as much as the body does. Just as food can be nourishing for the body, so are words. The words we use both verbally and internally in mind can help nourish our spirits. Thus, words that you speak aloud can have many effects on both the person they are spoken to and the speaker. Plays often have a dramatic effect based on the flow of words from the actors. But you do not need to speak to affect. Our thoughts can help empower or break us down internally. Hexagram 27 calls for a time to reflect on the type of words a caster is currently using. Are they having a positive effect to help inspire both the speaker and the listener? Or are their words being used to torment and break down others? How we speak is a representation of our inner being and can often show the true side of a person. Use words wisely to prevent chaos in the world. It is easy to become angry and choose to use hurtful words. It is important to have a strong tolerance against what others may say to anger us. I Ching 27 says the spoken word can often be wonderful. Music and the theater are ways to enjoy the words of others in a safe environment. Listening to the advice of loved ones can be very helpful and enjoyable. Sitting in on a lecture can help a person gain knowledge on a certain topic of interest. These are just a few examples of the benefits of the spoken words. History is full of powerful speeches from leaders that have influenced a large mass of people to react. This might either be in battle or against those that would hold them down. There is no limit to the power of the spoken word. But not all words are spoken, but instead thought and internalized. These words are also essential and work to either strengthen or destroy the spirit. 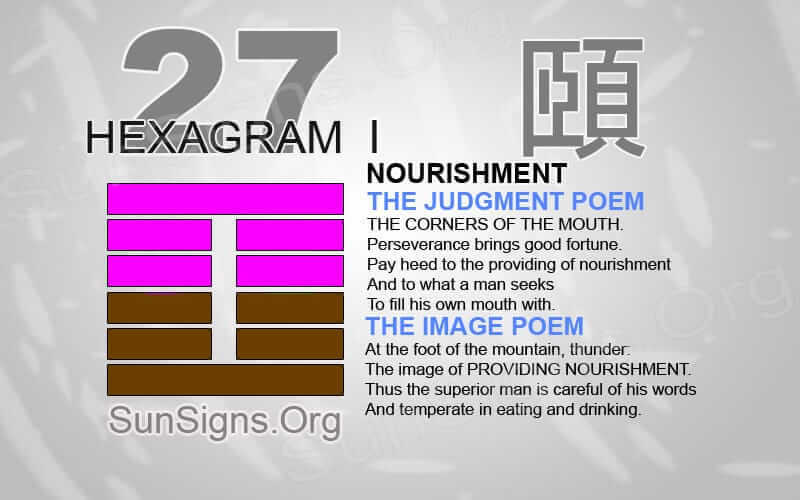 Hexagram 27 yijing is a means to help nourish the spirit. It strengthens the mind against our thoughts and the words of others. Thoughts of negativity and low self-esteem may have been flooding the mind lately. Just take this time to meditate and clear the mind. Also, prevent the mind from forming these thoughts. Dismiss them as soon as they arise. Remind the mind of personal strength and skills that counter these thoughts. There is difficulty in deciding what words to use in a situation in your relationship. It takes patience and experience before it can become easier to decide the correct order of words. In any situation, it is imperative to remember that the wrong choice of words can tear down a relationship. Choose your words wisely when dealing with others in business or at your workplace. The wrong words can destroy a possible opportunity. This is under the influence of anger or frustration. To fill his mouth with. The old saying ‘sticks and stones may break my bones, but words will never hurt me’ is no longer relevant in today’s society. The impact on how we act and react to others verbally can have tremendous repercussions. Practice discrimination and mental determination to be very conscious of the words you use. Taking the time to choose the right words for a situation is often necessary. Allow a moment to collect your thoughts that will make sense and be clear.